Bored of your usual office ensemble? 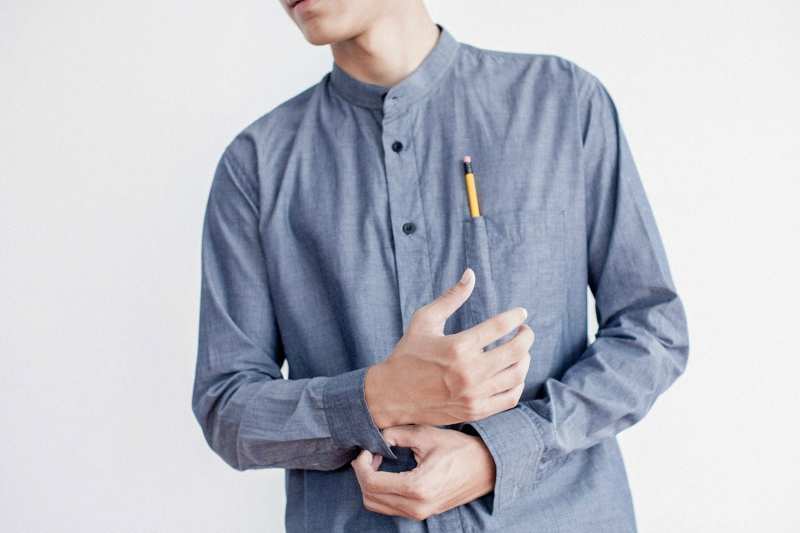 Mix up your standard business attire with Idle HQ's complete guide to work shirts, so you can look slick any day of the week. Read more Men’s Style Guide features and check out our Store. Stuck in a rut with your work wear? Are you always opting for the same plain shirt you wear day after day, week after week? Well, worry not. There are so many more options out there for you to wear to work, most of which are ones you wouldn't have even thought of. From adding a bit of print, to changing up your shirt style, collar, fit or fabric, you can mix up your office wear with ease. Regardless of your industry, your business look doesn't have to be boring or monotonous. Here's our top guide on the best men's work shirts. The best work shirts are hard to come by. Sometimes they don't fit, they're uncomfortable or they simply don't suit you. 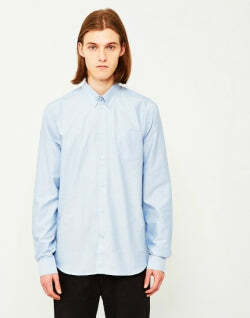 The trick to getting the work shirt right is to stick to the classic styles and colours as these won't do you any harm. Go for the classic white, black, blue and pink to get your work shirt wardrobe going as these are great base colours to work around other pattern and colour. 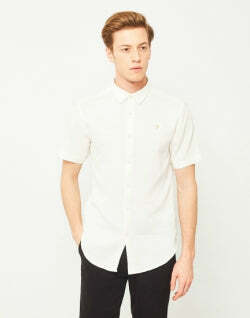 This selection from The Idle Man is ideal if you're looking for versatile, classic cut designs. Teamed with a pair of slim-legged trousers and a pair of formal shoes, such as brogues or loafers, and you've got yourself a cracking work look no matter what the season. Good quality shirts are sometimes hard to come by, especially when there are so many cheap work shirts available. There are many brands and styles available out there when it comes to work shirts, but the key is to know what your budget is and what style suits you. 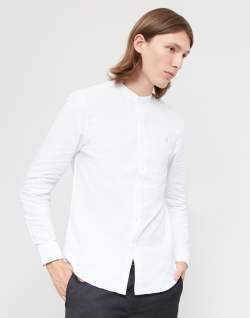 Personally, go for the simple and classic white button down work shirts, as this will be the most versatile and easy to wear piece you'll own. Brand - If it's a higher quality brand with a higher price point then nine times out of ten it will be a great quality work shirt that will last you years. 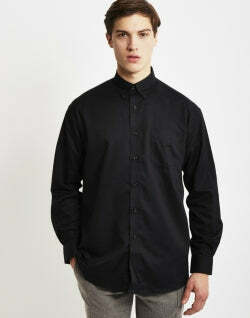 Material - Feel the material, good quality work shirts for men will be slightly thicker and soft to the touch. Buttons - If the buttons feel cheap, then I'm afraid you've got yourself a cheap shirt. 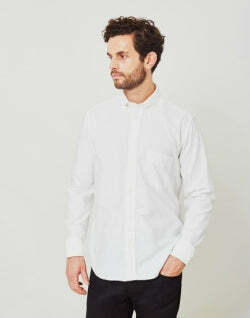 Stitching - The stitching is a massive giveaway for a good quality men's work shirt. If the stitching feels loose then it will probably wear out quicker. Shirts are available in a variety of styles, and this includes minor details such as the cuff type. There's a range for you to choose from, but make sure it's work suitable as there are some which are better suited to formal events such as weddings. Stick to the most common type, the button cuff. It consists of a single cuff that wraps around the wrist and buttons into place, this functional option can offer square, round or angled corners and some versions provide an additional adjacent button for adjustment. Avoid the Cocktail or Turn Back Cuff, a double length two-button barrel cuff, this then folds back on itself, while the corners are usually rounded to avoid any snagging in the jacket sleeve, and the French Cuff, which folds back around the wrist and is fastened by cufflinks rather than buttons. These cuffs are incredibly formal, so stick to simple style for work. When it comes to shirt collars, the rules aren't as strict for work shirts. It's whatever you prefer. The Point Collar is the most common style. The forward or straight point collar is cut using straight lines and with a relatively small spread. This collar is better suited to a wide face. The spread collar, or Windsor collar, comes in various widths and angles, revealing more of the upper shirt or tie. This one's better suited to those with a thin face and neck. 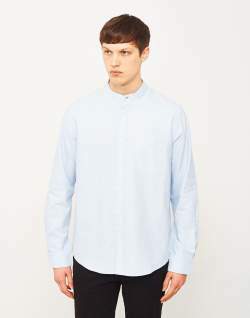 The button-down collar attaches the collar corners to the shirt. This is the most common style that'll you need to go for when dressing for a smart job. It keeps the look clean and slick and still keeps it formal once your blazer is removed. It's also a great option to dress up jeans, which is essential in the creative industry. 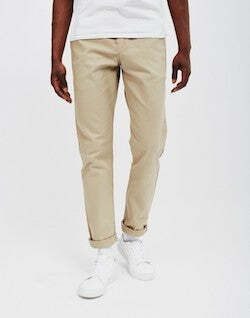 Short sleeves lean more towards casual attire but are also great for warmer months. If you're at an office job, just swap this for your usual shirt to stay cool. If you work in a creative industry, button all the way to the top and team with smart trousers. 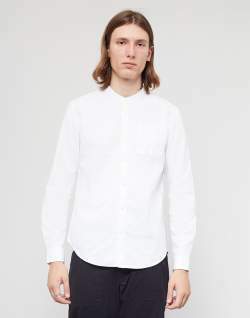 Nothing beats the classic long sleeve work shirt; its practicality and smart style make it the perfect option for many men. Remember what I said before, though, stick to the classic colours and styles that will see you through the year, however, you can add in a solid block colour such as a darker navy or grey to differentiate your work shirt wardrobe. They're a perfect option for when the warmer weather strikes and you need something that's smart, stylish, and at the end of the day, will keep you cool. Again, you'll want to stick classic colours, because if you go down the printed route, you may be at risk of looking like your dad in the 80's. The Idle Man – Shirt. The great thing about work shirts is that there are no guidelines on what specific type, or fabric, it needs to be, leaving you with so many options. These are the most comfortable fabrics yet versatile, that can take you through the day with ease. 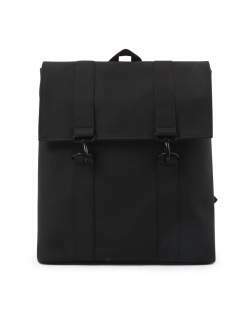 Each is available in a variety of colours so the possibilities are endless. The fabric however, will depend on the type of shirt you choose. This is an option that most of you wouldn't have even thought of, but the Grandad shirt is incredibly formal, it's just missing a collar. 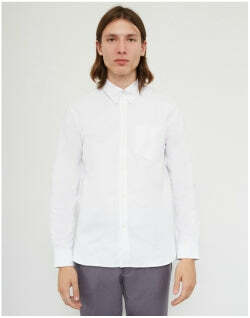 The Grandad collar shirt is very similar to the oxford shirt in terms of fabric. 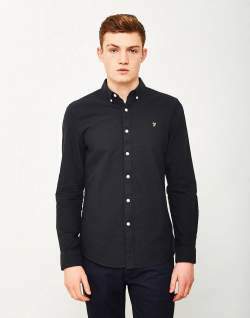 This shirt looks great teamed with smart suit trousers or even jeans and chinos. It can dress up most of your looks with ease. Although many think the collar makes it more casual, this isn't the case. 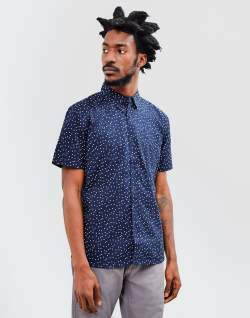 It'll add an edge to your look that you can't get with other shirts, and if you button it all the way to the top you'll achieve a unique yet sleek finish. The smart shirt is the standard style which most of you will opt for. 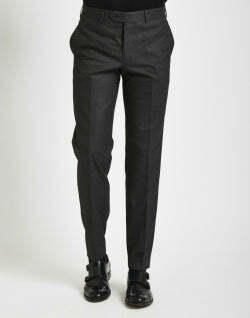 They come in a variety of fabrics and colours, making it the easiest option for work attire, particularly office jobs. The pocket is functional allowing you to pop in pens, and they can also take you through to formal events. What more could you want from a multipurpose shirt? This is a great option shirt for those who have just started a job, or those who don't know what the dress code is at work. Many office jobs stick to the suit, shirt and tie combinations, so this shirt is ideal for these work situations. Stick with neutral in order to mix and match with your suits, or add a pop of colour with a printed or block bright colour, such as light blue or pale pink. This style of shirt is hard to style for work, but worn correctly, it can take your business look from drab to fab. Go for darker shades in order to add formality. You can also pop on a tie to dress the shirt up further. Just remember to always finish this look off with both smart trousers and formal shoes such as brogues to keep it work suitable. 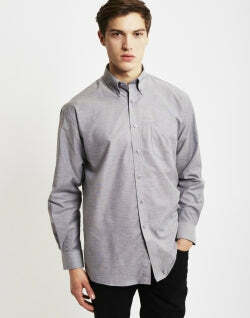 Another slick edgy option for those wanting to steer away from the smart shirt. 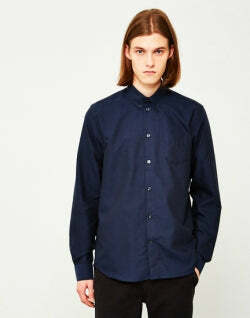 The oxford shirt can be dressed both up and down. It can easily be teamed with suit trousers for formal work wear, but if you work in a creative industry, then team with chinos or jeans for a smart casual look. Again stick to neutral shades to make the most of its smart function. Much like denim a flannel work shirt may not be your first option when it comes to work shirts for men, but, again, you'd be surprised. Because the flannel shirt comes in so many colours and patterns, you can really play about with what shirt you want to wear to the office. If your office is a little more subtle and formal, then go for something a little darker and subdued. If your office is a little laxer when it comes to office attire then a brighter option is always there for you. Now a denim work shirt might not be your first port of call when it comes to the best men's work shirts, but you'd be surprised. A denim shirt can be a practical and smart option when it comes to men's work shirts, and the variety of shades you can get makes the choice endless. You'll want to pair your denim shirt with a pair of black or grey trousers to keep the look formal and smart for the office.